Who don’t know this brave girl Malala Yousafzai. She is a Pakistani education activist and youngest noble peace laureate, who was shot by Taliban gunman in Swat valley in Pakistan because for her work advocating girls despite the warning of local Taliban. After she was injured, she was taken to the Rawalpindi institute of Cardiology and later on sent to the Queen Elizabeth Hospital in Birmingham, UK. The murder attempt created an outrage internationally and people came in support of Yousafzai. She had been blogging for BBC about life under the threat of terrorist group after an edict by the militants in 2008 banned girls from attending school. She also founded Malala fund , an advocacy organization for girls education worldwide. She also became the youngest United Nations messenger of peace. Now she lives in Birmingham with her family and plans to follow the footsteps of her idol Benazir Bhutto, who completed a degree in PPE. She has also applied for the same degree i.e. Philosophy, politics and economics. She is inspired to be a politician by her father who is a poet and women’s right activist. 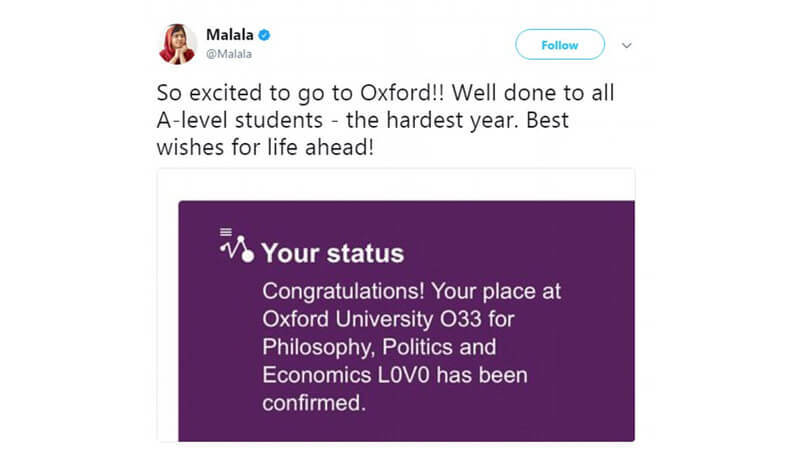 To get an admission in the Oxford she earlier shared that she needed to achieve “A “ grades in a subject based prerequisite exam which is conducted by school in U.K. Yousafzai took the exam in math, history, religious studies and geography. On Thursday she tweeted and shared the screenshot of acceptance and said “So excited to go to Oxford!! Well done to all A-level students – the hardest year. Best wishes for life ahead!”She celebrated her acceptance after getting her A-level results. Malala has always encouraged young girls to pursue education and now at 20 she is all set to attend the college with full enthusiasm and courage. She acts as an inspiration for many girls who are not able to raise their voice against their rights. She is also one of six people to be honored with Canadian citizenship.